A couple of weeks ago, I found this neat tutorial for making a water blob on Pinterest, and it looked like so much fun I was dying to try it. 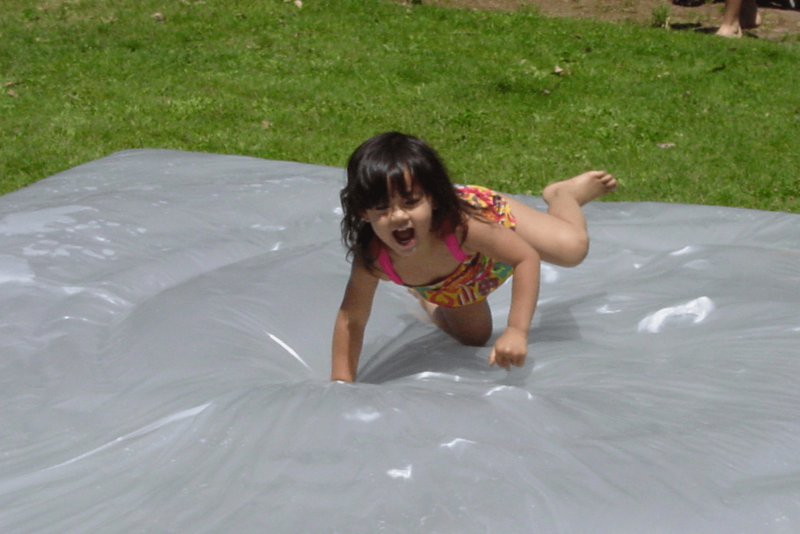 You’re probably asking yourself what a water blob is, am I right? 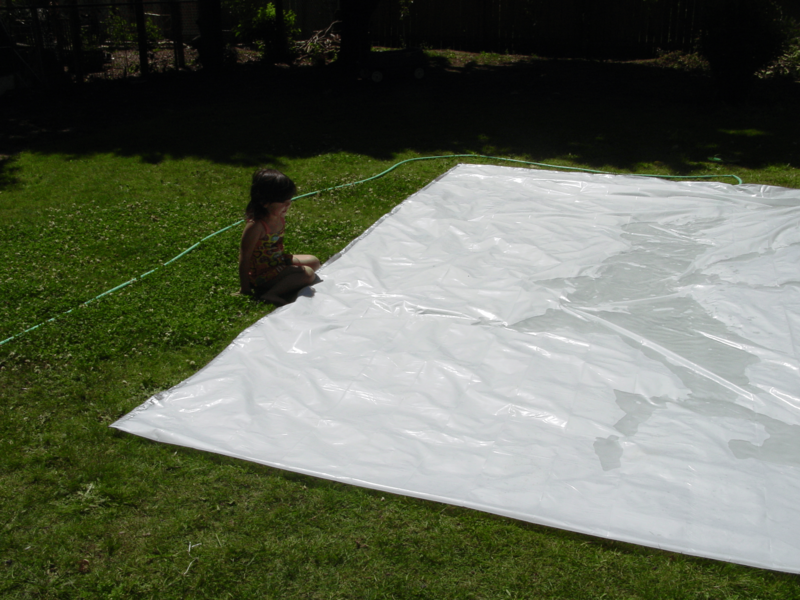 Well, basically it’s a plastic drop cloth (like you would use for painting) folded in half, with duct tape around the edges & filled with water. It reminded me a little bit of a water bed actually. A large roll of plastic sheeting (at least 3 mil thickness) and duct tape or another kind of strong tape. You can get this at a hardware store like Home Depot, Lowes and I have heard, even at Sears. I used a 10’x25′, 3.5 mil thickness. I got the value pack, so we can do it again! 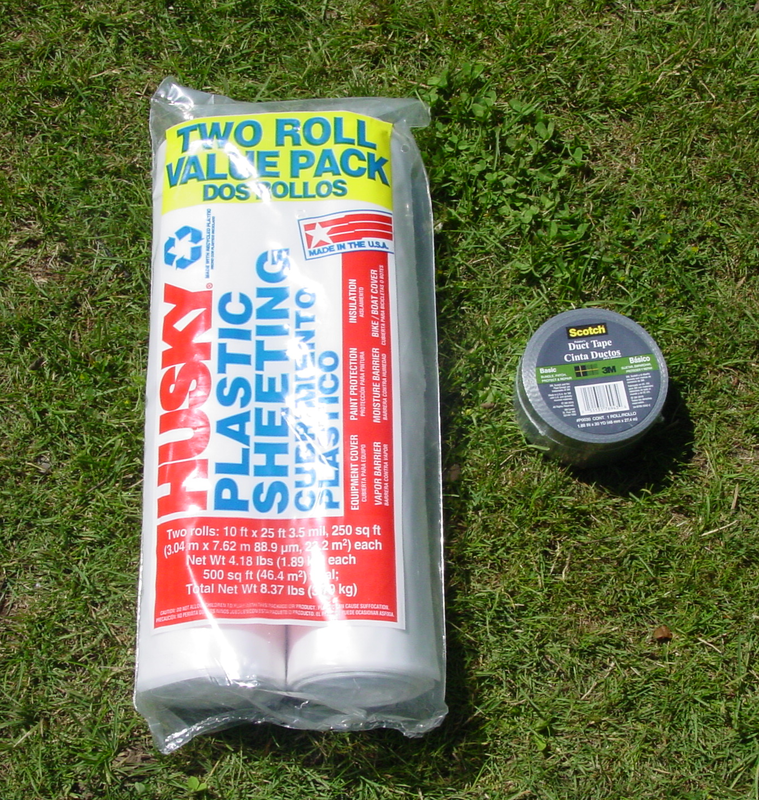 You will end up using nearly the entire roll of duct tape, so if you plan to do it twice, get two rolls. Start by rolling out the plastic on the ground and folding it in half. Next, tape up the edges of the plastic with the tape. I think one of the errors I made was taping it on the grass. It wasn’t cold outside or anything, but there must have been a bit of morning dew in the grass, which made the bottom of the plastic feel damp as I was taping. Next time, I will tape it on the cement and then move it over to the grass. Try to get the tape on as flat and straight as possible. It will be harder to fix when you start filling it with water, so try to be thorough from the onset. Remember to leave a small opening for the hose. Now it’s time to bring in the hose and fill er’ up. If your yard is like mine and not level, try to get it to the most flat, grassy spot you can find because the blob could potentially roll. If you’re planning to add color or glitter or soft toys, now is the time. Since we didn’t have any food coloring, we tried to add a few packets of Kool aid. However, it was only “kool” for about 5 minutes before is disappeared. When it’s full (takes about 20-30 mins), remove the hose and tape up the opening where the hose was. This was where I had a bit of a hard time. My kids were trying to help me with this and I couldn’t seem to get that area dry and taped properly. The first breaches we had came from this area, so a good dry, flat tape job is crucial here. Once it’s all taped up, you’re set. Let the kids play! We did notice that after just a few minutes of jumping it was starting to get marks. It was still fine to play on for a while though. 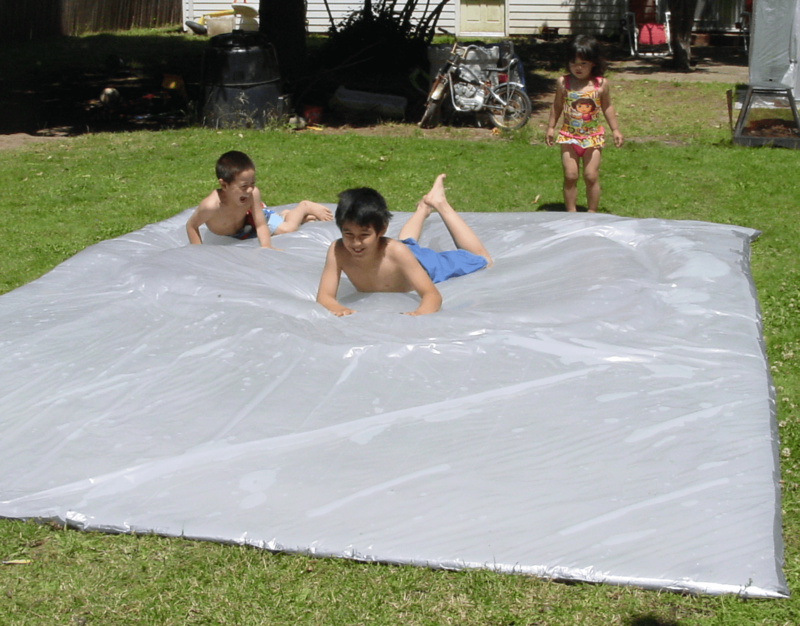 The kids were able to lay on it, roll on it, somersalt, jump, etc. 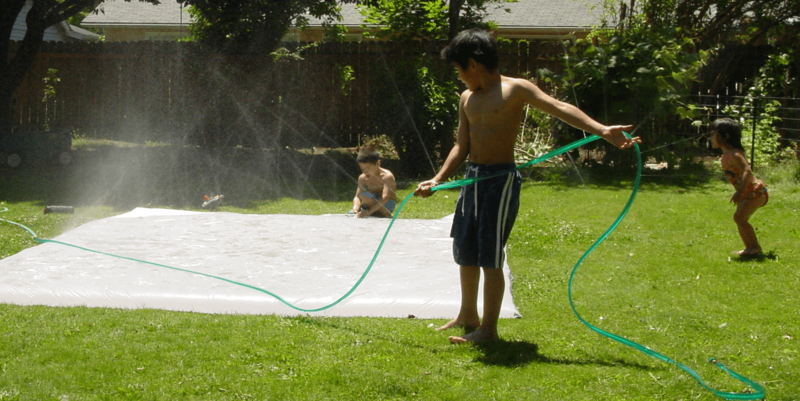 The nice thing about the blob is that the water feels cool through the plastic, but your kids aren’t getting soaked, so if it’s not a super hot day, the kids can still have fun with water. Fortunately for us, it was a pretty hot day, so we decided to add the sprinkler to it for even more fun. Our water blob survived for about an hour and a half before there were big holes in it, but my children are somewhat brutish, so I’m thinking it would probably last longer for most other kids. Once there was a hole in it, it made a fun splash puddle for the kids. After it was popped it was time to let the dog out. He loved it too! I have to say that it was a ton of fun. If you are looking for a fun idea for a toddler birthday party or a fun 4th of July activity, this might be the thing for you. Let me know how it works for you. Looks like lots of fun. I think I would have trouble getting it to tape up well. I am just not that good with tape. We may have to try this at our home when we get some sun. Thanks for sharing this idea. Yes, the tape is the tricky part. I had to go back over and double check to make sure I got all the edges. Having someone to hold it straight for you might be a big help too. Have fun! I am so excited to try this! I pinned it a few weeks ago but I was apprehensive in trying it. I think since we might actually get sun this week I will make one for the kids. Did it damage your grass at all? Nope, no damage to the grass. It was only up for one day though. I think if you left it out for a few days it could damage the grass the same as an inflatable swimming pool would. Have fun Becca! This sounds like to much fun! What breed is your dog? He look just like ours! :) It looks like one of his ears stands up and one lay down? That is how our dog Rosco’s ears are. We are SO going to try this! You will have so much fun Penni. Our dog is a mix of lab, heeler, husky, german shepherd and maybe more. We’re not totally sure. But he is a good dog. His ears do funny things. Sometimes they stand up and sometimes they flip up behind his head, lol. What breed is yours?